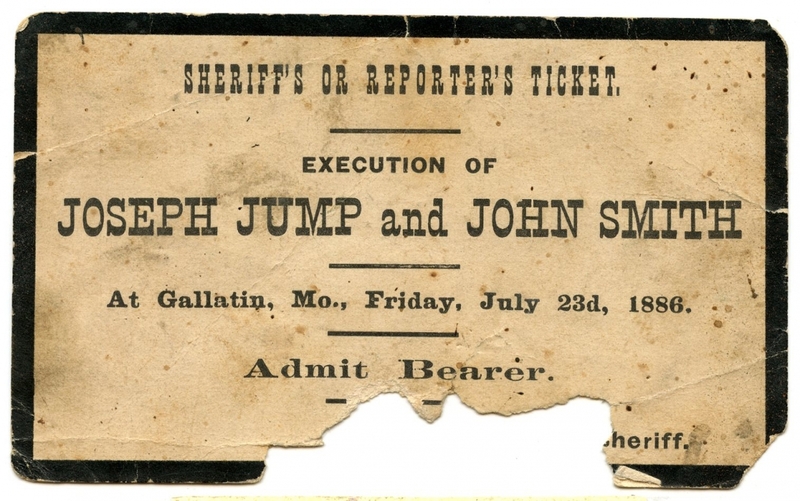 Few Missourians can relate details of what is commonly called the “Mormon War.” Historians mark it as a dark chapter in state annals, when the person of Missouri’s highest official rank ordered the extermination of a group of citizens based on their religious belief. Mormon troubles in Missouri can be chronicled in three general time periods: Mormons small in numbers (1831-32 while in Jackson County), Mormons disorganized (1833-35 while in Clay County), and Mormons isolated (while in Caldwell/Daviess counties 1837-38). 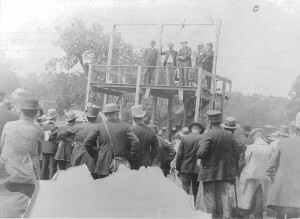 The last confrontation between non-Mormons and Mormons climaxed at Far West in Caldwell County and ended with Mormon surrender at a “fort” near Adam-Ondi-Ahman in Daviess County. Caldwell and Daviess Counties were created out of Ray County as a legislative act of compromise. The idea was to isolate Mormons from other Missourians while providing some sense of compensation to Mormons squeezed out of their holdings in Jackson and Clay counties. By coincidence, the financial collapse of the Mormon Church at Kirkland, Ohio, prompted a migration of Mormons westward at this same time. Lyman Wight founded Adam-Ondi-Ahman in 1837, which quickly grew to a population of 500. Although Gallatin was the county seat of Daviess County, it was merely a frontier town of a few hundred with few buildings. Within months, Far West swelled to several thousand inhabitants with hundreds of buildings. All indicated similar growth would occur at Adam-Ondi-Ahman. Thus, not only did the Mormons’ highly structured and vastly different social and economic community intimidate non-Mormons, but their explosion of growth did as well. On July 4, 1838, Sidney Rigdon delivered an address openly stating a Mormon consensus that they would no longer tolerate anti-Mormon actions from outsiders. Outcasts from the faithful plied on this speech and probably exaggerated accounts of Mormon tyranny and aggressiveness. By election day, Aug. 6, a drunken brawl erupted at Gallatin. Two days later, 150 Mormons compelled County Justice of the Peace Adam Black to sign a document guaranteeing Mormon civil rights in Daviess County. This brawl spawned raids initiated by both belligerent sides throughout this region. In retaliation, the Mormons organized to pillage and burn Millport on Oct. 18. Some accounts claim Gallatin was burned also, though others argue that the Mormons did not cross south of the Grand River. Regardless, the action at Millport was viewed by many as open rebellion against the state. Non-Mormons in Daviess County were quick to call for assistance. On Oct. 25, some 60 Mormons led by David W. Patten fought against non-Mormons at Crooked River in Ray County. On Oct. 26, 1838, Gov. 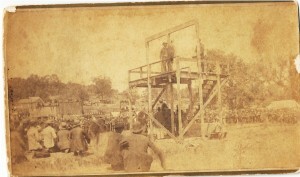 Lilburn Boggs called to muster the First, Fourth, Fifth, Sixth and 12th Missouri Divisios of Militia — some 2,200 to 3,000 men — to “exterminate” the Mormon menace from the state. On Oct. 30 some 200 non-Mormons attacked at Haun’s Mill in Caldwell County, killing 17 Mormons. On Nov. 1 the militia converged on Far West, which surrendered. The church account states that all Mormons brought before the inquiry were acquitted. Gen. Wilson ordered all Mormon families out within 10 days but offered permission to winter in Caldwell County, then to leave the state under the extermination order. 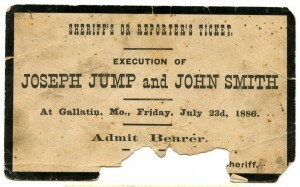 Orders to execute Mormon leaders were not carried out. Mormons moved on. Some went to Lamoni, Iowa, some eventually to Nauvoo, IL. Public fervor waned as the legal process stretched out. A trial was set for six Mormon leaders for April 8, 1839, in Daviess County. A change of venue was granted to Boone County. While transferring prisoners there, Daviess County Sheriff William Morgan and four deputies more or less allowed the Mormons to escape without any repercussions from an increasingly disinterested public. Historic sites in North Missouri of interest to the followers of Joseph Smith in the Church of Jesus Christ Latter Day Saints (LDS) — Adam-Ondi-Ahman, Far West, Haun’s Mill, Crooked River, Kingston Cemetery, Pioneer Cemetery, Zion’s Camp, Liberty Jail.